You are creating some clever iLogic models, but when using the ‘Feature.IsActive’ iLogic snippet to switch between different features, you are finding that your code is lengthy and repetitive. You’ll often have a number of possible features in a part, and need to activate only one of them depending on your required configuration. To achieve this you’d typically create a multi-value parameter, and depending on the value selected for that parameter, suppress all the features except the single feature you want. 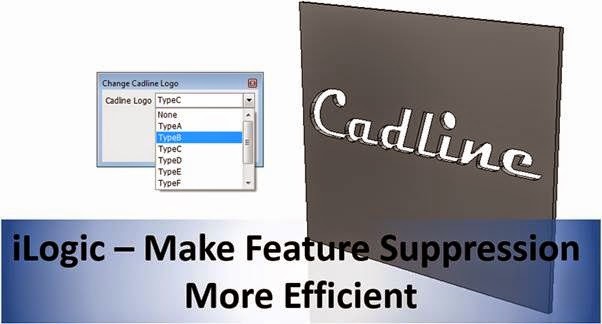 We have a Cadline logo plaque (as shown in picture above) and we need to switch between 8 different logo formats, called TypeA, TypeB, TypeC etc. These are all separate features in the model and so we’ll always have 7 of these features suppressed and just 1 of them activated. We also want the option of switching ALL the features off if we don’t want any logo at all. (Notice the 9th possible value of ‘NONE’ to dictate suppression of all the features). So using this parameter, In order to accomplish our feature suppression, here is the code we’d need to activate just one of these features – brace yourself – I’m going to paste the whole lot! ElseIf CadlineLogo = "TypeF "
Ouch. That’s a lot of copying and pasting. Surely there’s something we can do to reduce the length and repetitiion of that code? Well yes – on the important condition that we use the same names for the features as the values in our multi-value list (i.e. 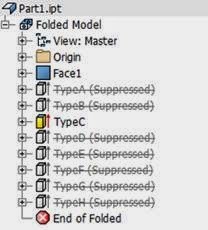 in our example the features should be called TypeA, TypeB etc…). If this is the case then the code can become much shorter and more elegant. 1) Run through all of the values in the multi-value list for the parameter “CadlineLogo”. 2) If it finds a feature with a name that matches a value in the multi-value list, but not the current value, it will suppress it (as another feature should be active). 3) If, however, it finds a feature with the same name as the current value of the parameter “CadlineLogo” it will set that feature to be active (un-suppress it). The nice bonus with this method is that if there is no feature with the same name as the current value of the parameter (for instance if the current value of the parameter is “NONE”) then the rule will suppress ALL of the possible features. 2) Create a multivalue parameter called ‘CadlineLogo’, with values ‘FeatA’, ‘FeatB’, ‘FeatC’. 3) Create three features called ‘FeatA’, ‘FeatB’, ‘FeatC’. 4) Paste the iLogic code below into the part. 5) Change the value of ‘CadlineLogo’ parameter and see the model update. 1) This code should work fine with multivalue numeric parameters as well as multivalue text parameters. 2) If you need to add more potential features to switch between at a later point you won’t need to copy and paste any code in the iLogic rule. You simply need to add the new value(s) to the multivalue list for the parameter, and then make sure the new feature(s) have the same name, and are spelled correctly! 3) You can also duplicate this method any time you need to activate only one of a long list of possible features. Just replace the ‘CadlineLogo’ text in both locations in the code and you’re good to go. Let me know your thoughts. I’ll consider using this method on all my iLogic models in future I think!